Hay docenas de tipos diferentes de buques, cada uno hecho a la medida de las necesidades de transporte de un tipo determinado de mercancía. Una carga de petróleo crudo, que es fluida, tóxica y contaminante, necesita unas condiciones de transporte totalmente diferentes de, por ejemplo, un coche. La carne congelada se debe transportar con refrigeración y en unas condiciones completamente diferentes a las del vino, del mismo modo que los animales vivos exigen condiciones de transporte diferentes de las flores cortadas. Esta sección describe los diferentes buques que se utilizan para el transporte marítimo y las diferentes y diversas cargas que pueden transportar. Carrying a wide range of cargoes from gas and crude oil to alcohol and acids, the Tanker family of ships include some of the world’s largest mechanically propelled floating objects. 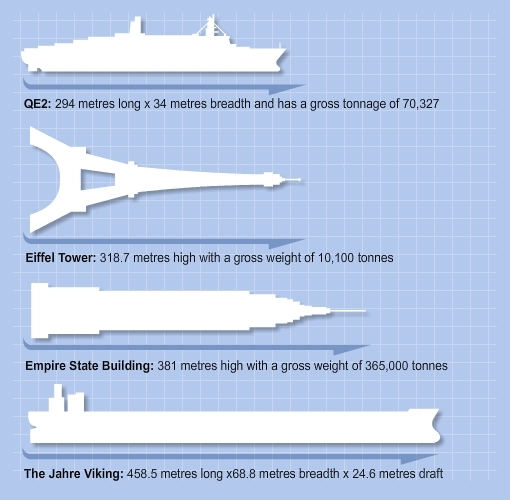 At just under half a kilometre long, the world’s largest tanker is more than 4 times longer than the average football pitch. Crude oil tankers, the largest of the group, carry oil from the oil producing countries, such as in the Middle East Gulf, to the refiners, such as North Europe. Product tankers are the smaller sisters of the tanker family, carrying the oil that has been refined into oil products, such as gasoline or diesel. Other important members of the tanker family include chemical tankers, which are specially designed to carry corrosive acids and wines among other things, and gas carriers, moving methane and other gases in a Liquefied or compressed state. What makes the tanker fleet particularly special is its adaptability. Changing demands for its cargoes mean that there may be more business in one part of the world for one month, but that could switch dramatically the next month. Its responsive nature means that ships can be switched between geographical areas to add or reduce capacity as the need arises. Crude oil tankers are designed to carry crude oil from oilfields to refineries around the world ­ usually making the return journeys in ballast. The size of these ships increased steadily, peaking in the 1970s in order to bring economies of scale and the cost of oil transportation to the absolute minimum. The era of the `supertanker’, which commenced in the 1960s, quickly led to the construction of a very large and ultra-large crude carriers (VLCCs and ULCCs) which are the biggest ships ever built. As cargo-handling technology progressed, many tankers were generally fitted with steam coil heating in the cargo tanks to keep heavier grades of oil viscous and speed up the discharge of cargo. They were also equipped with crude oil washing equipment for tank cleaning and inert gas systems to reduce the risks of fire and explosion. Some of the latest tanker newbuildings, incorporate other extensive safety features from double hulls, double engine rooms, propulsion and steering equipment. 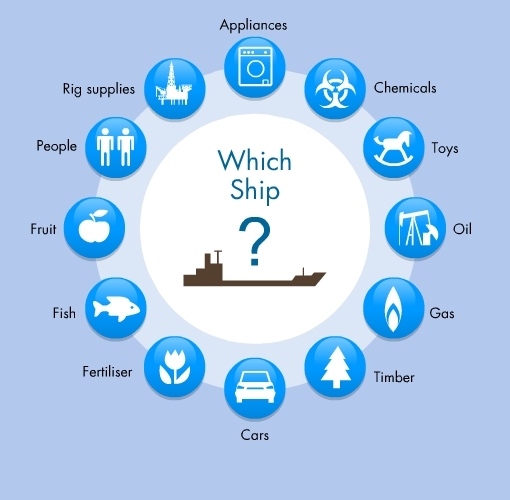 Ship navigational and communications systems have also become increasingly sophisticated in recent years. Chris Sabino is a sophomore at the Academy of Technology and Engineering High School (AITE) in Stamford, CT. Chris is a member of AITE’s graduating class of 2020. Chris attended middle school in Stamford at Scofield Magnet where the yearlong 8th grade Exhibition project is the culminating activity for students. This project is an opportunity for students to develop and demonstrate their abilities as learners and teachers. The project is based on the realization that we live in a constantly changing and technologically-oriented world, and inspires students to focus their Exhibition on a particular technology that they are interested in. The students complete a research paper, a slideshow that they present and a creative portion such as a model. This project allows them to master a realm of information, largely technology-related, to present their knowledge to peers and adults using a variety of media, and to respond to probing questions about their area of expertise. Chris choose the subject of Parcel Tankers because of the vast amount of technology involved with that field, and because he was amazed at how much shipping, and in particular parcel tankers, affects our everyday life. His teachers’ and peers found the subject fascinating and uniquely different from some of the more typical exhibition subjects chosen, like a football helmet or light-bulb.